That form defines energy and energy manifests information is the central concept of Form School feng shui. Every existing thing in the universe has three components: matter, chi energy, and information. What is visible to us is the matter aspect – but that contains the chi energy aspect, and the information aspect, even though they are not directly visible to us. Since form defines energy, any form will reveal the chi energy aspect and the information aspect to people who know how to see what appears before them. For example, the logo of a business is a material form that encapsulates all aspects of the company, including the energetic and information aspects. If one understands how to “read” the logo, one can understand the situation of the company. All successful companies have good logos. The same is true of candidates’ logos in elections. It is not really difficult to tap into the information aspect of the electoral situation from the logos that are used, and predict the outcome of the election before it actually occurs. So let’s entertain ourselves by looking at the upcoming US presidential election in terms of the logos used by the current candidates for nomination as Democratic and Republican candidates. Of the Republican candidates, the logo of Donald Trump reveals strength and assertiveness. However, the strong, blue color is reminiscent of the blue tone of the McCain/Palin logo, though Trump’s is much stronger. The dominating blue color, however, transmits a lack of warmth, and a lack of yin-yang balance. His logo is too static, too yin. Ted Cruz’s logo projects a friendly and convivial feeling; the flaw is the flame. The flame tries to suggest the stars in the American flag, but the small star is too weak and fragmentary. It would be better to move the star from the flame to a spot within the “C” in “Cruz”, and make it bigger. 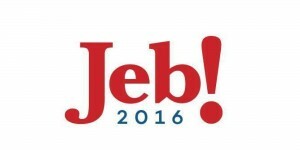 The logo used by Jeb Bush is too short, almost juvenile. It is not surprising that his campaign was short-lived. In Ben Carson’s logo, although the form is strong, the colors are muddy rather than sharp and crisp. According to yin-yang theory, “Ben” should be blue and “Carson” should be red. Marco Rubio’s logo is too long: stretched out, it loses focus and power. Furthermore, “Marco” should be blue, and “Rubio” should be red, to work in harmony with natural law. The line “A New American Century” does not convey a clear message. 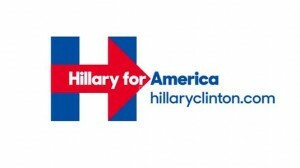 On the Democratic side, Hillary Clinton’s logo, with the background H and the red arrow enclosing “Hillary for America”, seems stuck in holding on to the base, and not going beyond it. This quality is also emphasized by the repetitiveness of the logo, which focuses on “Hillary” not only in the initial, but also in the slogan, and in the web address. 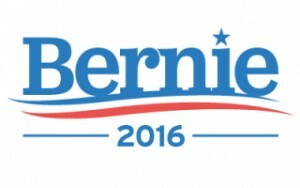 Bernie Sanders’ logo is the most friendly. However, the base is not solid. It is interesting that Hillary Clinton’s logo projects a more masculine quality, and Bernie Sanders’ logo projects a more feminine quality. I have re-designed Bernie Sanders’ logo to provide a stronger base – which in fengshui we call the “mountain” feature, the one that provides the support. If by some chance his campaign picks up this re-designed logo, he might have a much better chance of prevailing, and becoming the next president. Although the likelihood that he will adopt this redesign is slim, if he does take the bold step of changing his logo now, he might have a better chance. If Trump prevails in the primary, since his logo has no yang energy, either Hillary Clinton or Bernie Sanders should be able to beat him handily. This is how it looks from the point of view of Form School fengshui. That’s my take, anyway: what do you think? Let’s see how it actually plays out! This entry was posted in Blog, Feng Shui and tagged candidate, logo on February 28, 2016 by Shan Tung Hsu. I like Bernie’s the way it is. The waves connote living energy, chi, breath, and flexibility. The redesign is flat and static. Sorry. Bernie’s current logo does reflect his personality and ideas. However, those qualities itself cannot be elected as a president. He may be a happy senator, but it requires a strong mountain, or base for him to be elected. That’s why we modified this. In the political world, between kind and strong, people choose the strong one. I love this article. I took the innitiative to email this to an address I found for Bernie Sanders. I am an Acupuncturist and Bernie supporter. Thank you for this article. Hopefully the email makes its way to his desk. Thank you. It’s good to hear someone resonates with my point of view!